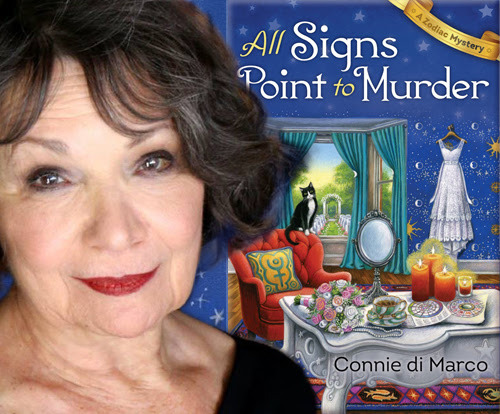 Today we have the pleasure of meeting up with author Connie di Marco to talk about All Signs Point to Murder (8 August 2017, Midnight Ink, 336 pages), a Mystery, book two of Zodiac Mysteries series. A very warm welcome to Connie di Marco; thank you for joining us on BooksChatter! Here at BooksChatter we love music; do you have a music playlist that you used in All Signs Point to Murder and the Zodiac Mysteries, or which inspired you whilst you were writing it? "Thanks so much for inviting me to visit today. I wish I could give you a list of music, but when I’m writing, I really need silence, so I can listen to the voices of my characters in my head. As much as I enjoy music of all sorts, it distracts me when I’m working. My tastes are very eclectic, I love late 1950’s rock and roll, I love haunting jazz played on a saxophone, and I love the sound of a cello or even a harp. If there were one instrument I wish I could play, I think it would be a cello. Julia Bonatti, my San Francisco astrologer in the Zodiac Mysteries, has very eclectic tastes as well. In one book, she references ethnic music that her former fellow grad students recorded in various spots around the world – Bulgarian women singing a capella and music from Chinese Turkestan. The more exotic and unusual it is, the better Julia likes it! " What was the inspiration for All Signs Point to Murder? "The jumping off point for this book, All Signs Point to Murder (Book 2 in the Zodiac Mysteries), was a real murder that happened several years ago. I knew one of the people involved and when I first learned of it, I was shocked. When I discovered who was charged and imprisoned, I was even more stunned. The more I thought about this crime, the more I began to think the wrong person had been arrested. So, changing the location, the names, and the events leading up to the murder, I tried to imagine what could have really happened, how it could have really been done. And who the guilty party might really be. That’s how this story began. Julia, my protagonist, is a member of a wedding party in which one of the people involved is killed. Her close friend, the bride, is heartbroken and asks Julia to investigate and hopefully find some answers for the family. Julia’s reluctant to get involved, but out of loyalty to her friend she does investigate and eventually unmasks the real murderer." "I think every writer can’t help but include much of his or her self when creating a protagonist. Julia’s a practicing astrologer, and I’m not, although I have read widely and can speak credibly on the subject. If a reader is interested in the subject, they may glean quite a lot from these books, but the Zodiac Mysteries are first and foremost mysteries. Julia’s profession is really meant to be an unusual and interesting hook, even though she uses astrology to solve the crime(s). Julia’s outlook on life and her values are probably pretty much the same as mine, but she is far more courageous and daring. She’s stubborn and determined and gets herself into a lot of trouble, even coming close to ruin or death in every book, but she always succeeds one way or the other. I think I admire her, and wish I had her courage and (maybe recklessness). So perhaps she’s an idealized version of who I wish I could be in her circumstances." The first thing that draws me to a book is its cover. Can you tell us about your cover for All Signs Point to Murder - why you chose that concept and who the artist is. "The name listed by my publisher is Ellen Lawson, although we’ve never been in contact. Like most writers who are traditionally published, I have no control over the cover art, and often, no control over the title of the book. Originally I had planned to name each book after a planet. The first book was The Madness of Mercury and my publisher was happy with that title and kept it. My original title for Book Two was Dark Sun, but the title was changed to All Signs Point to Murder, which isn’t a bad title at all. I’ve gotten used to it and really like it. These covers are very interesting, I especially like the psychedelic colors and the little astrological touches the artist has added. The cover of the first book, The Madness of Mercury, even has a small pentacle on the fireplace screen (if you look closely), and this book, All Signs Point to Murder, has zodiac symbols around the edge of the carpet and the symbol for Pluto on a chair pillow." Why should we read All Signs Point to Murder and what sets it apart from the rest? What makes your series unique? "The Zodiac Mysteries are traditional mysteries, but I always like to add thriller elements. At least those are the kinds of books I like to read. When I was writing the Soup Lover’s Mysteries (as Connie Archer) I felt it was important to minimize forensic details, to always make sure the village was a safe haven and trouble and evil came from outside. The fact that the Zodiac Mysteries take place in an urban setting opens up more possibilities for crimes of a wider range. Julia risks her life and comes close to death in every book. I enjoy the excitement of thrillers and try to make sure that the pace and the twists and turns keep readers turning pages to find out what happens next. Plus, I really wanted the city to feel much like a character in the stories. So I try to use the atmosphere and the moods and weather to play a large part in each story, to really make the city come alive. Julia finds herself in fog a lot. In fact she lives in a neighborhood that’s almost constantly in fog, a great backdrop for mystery. A lot of action takes place at The Mystic Eye, an occult shop and bookstore owned by Julia’s close friend and the shop itself is peopled with eccentric characters, like Zora, a psychic and medium, Nikolai, a past life regression hypnotist and others. Initially I didn’t plan on having these secondary characters appear in every book, but I realized after the first book in the series, that these characters add a lot of texture and I wanted them to appear again and again, even if they weren’t directly involved in solving the mystery. They are all part of Julia’s world." Can you tell us something quirky about All Signs Point to Murder, its story and characters? "Julia became “Julia” mostly because I think it’s such a beautiful name. It has an elegance and simplicity that I liked for a character who’s doing her best against great odds. When Julia’s fiancé was killed in a hit and run accident, she wasn’t able to continue with her life plans. She turned to astrology for solace and to try to make sense of what had befallen her. She never anticipated that it would become her life’s work, or that she would be very skilled at the art of synthesis and most importantly, be able to help so many people find their way. Julia’s grandmother is Gloria, and I think I chose that name because it was the name of a good friend’s mother and I liked it for that reason. Julia’s two close friends, Gale and Cheryl, and Zora and Nikolai at the Mystic Eye are based quite a bit on real people I know, so even though their names have been changed, they are still those people in my imagination." Who would you recommend All Signs Point to Murder to and what should readers be aware of (any warnings or disclaimers)? "I think anyone who enjoys an exciting, page-turning mystery, with lots of twists and turns and good plots would enjoy this series. Mystery lovers do want puzzles and I always stay within the strictures of the genre, but I hope I also manage to make each story exciting with lots of danger. I have no warnings or disclaimers to offer. If a reader is interested in the subject of astrology, they might like that aspect of the books, but if they’re not, that’s fine too. Julia is an amateur sleuth who just happens to have an unusual occupation that she uses to solve crimes. I’ve discovered that serious astrologers have taken notice of this series and have reviewed these books, so I always want to be accurate about what I say." If you could / wished to turn All Signs Point to Murder and the Zodiac Mysteries series into a movie, who would be your dream team? "You know, I’ve been asked this question before, and I always draw a blank. I think readers form their own images of the characters as they read. And of course I have my images of these characters too. It’s more the rule that when a production company takes over, writers lose all control, or must agree to that loss of control. For example, the Vera series and the Shetland series, both of which I adore, are credited as “based on characters created by Ann Cleeves.” Some of the productions follow the books faithfully, while others do not or are probably written by other writers. In the best of all possible worlds, I’d wish that the BBC or ITV would be interested in the Zodiac Mysteries. I really swoon over the high quality of British and European productions so if I had my ‘druthers,’ I’d let ITV or BBC do whatever they wanted with these books." "Oh yes, definitely. I’m a dedicated mystery and thriller reader, and absolutely love espionage novels too. I haven’t had the urge to write anything other than crime fiction. There’s nothing more fascinating than the psychology of someone who would commit such a crime, the psychology of the criminal and the victim. Those are fascinating areas to explore. Perhaps someday I’ll be inspired to write in another genre, but it hasn’t happened as yet." "I usually start with the crime and work my way backwards. For example, in The Madness of Mercury, I used the Jim Jones years in San Francisco as my inspiration. I think those events appealed to me as a backdrop for the main story because I’m both intrigued and appalled at the mindset of people who would give up autonomy over their lives and blindly follow a guru figure. In Madness, the followers of this Jim-Jones-like, venal preacher target Julia and she’s drawn closer to a very real crime. Once I have the kernel of an idea, I like to plot the story chronologically. I use different colored post-its for each story line or subplot or red herring. I guess you’d call it “storyboarding.” Perhaps I’m very visual and if I approach a new book this way, I can see the whole story in my mind. Then I convert all those different colored post-it’s into a long outline. Once I’ve done that, I know I have a road map. Elements can change of course, and do change, but I know then that I know enough to start writing." "My publisher already has the third Zodiac Mystery and they seem to really like it. I’ve tentatively titled it Tail of the Dragon. As I mentioned before, they may not approve of that title, but I certainly like it. A client and friend asks Julia to go undercover at his law firm where three people have received death threats. At the same time, some new information surfaces about the death of her fiancé. Julia’s journey will take her through many changes as she recovers from her personal loss and I hope to slowly unfold the story of the death of her fiancé through more books. I’ve started working on a novella that takes place before the beginning of the series and explains how Julia’s life came to be before the series started. It’s set in a small theater in the city that’s producing a revamping of an Agatha Christie play and of course a murder occurs there too! After that, I have plans for a fourth book in the series. Julia will find that she’s being stalked by a young Chinese boy who’s trying to find the courage to ask her for astrological advice. He wants to know why his mother has disappeared. That’s about all I can say about that idea right now, because I’m still working it out." "Hmm, I’m smiling. Julia has a twenty pound black cat named Wizard. He’s really the only man in her life. Wizard is modeled on a black cat we adopted years ago and is sadly no longer with us. A little girl who lived in our building found him on the street and brought him to my daughter who couldn’t resist, even though we lived in an apartment at the time that didn’t allow pets. My daughters hid him in a box in the closet and fed him with a dropper because he was so tiny. One day I heard a meow. Sigh . . . like all kids, of course, they promised to find him a good home right away. Famous last words. Needless to say, that never happened and he was with us for many years, growing larger and larger until he reached ocelet size. He used to take naps with me and wrap his arms and paws around my leg. He was a very special cat and everyone in the family was heartbroken when he died. (We still have his ashes in an urn.) And I will attach a picture of him!" "Thanks so much for inviting me today, Flora ~ happy reading!" Thriller elements? This sounds like a book I can get into! Thank you for this post. Hi Cheryl ~ Thanks for stopping by! I'm particularly fond of one of the scenes in this book, when the killer tries to do away with Julia. You'll have to let me know what you think! Flora ~ thank you so much for hosting me today! It's wonderful to share a photo of our beloved black cat!!! A scene in which the killer strikes is always interesting.Thank you for the chance at reading in the series. That's my favorite type of scene to write! And I try to imagine the worst (almost inescapable) one I can. The death-defying scene in All Signs Point to Murder is one of my faves. Hope you like it too!